Lazada.com.ph, the leading and biggest online shopping mall in the Philippines, is extending 15% off on all items to Visa (credit or debit) cardholders of all banks. This event is on December 12, 2013 from 2 to 4 p.m. It is part of Lazada’s Online Revolution, known to be the biggest online sale’s event in the Philippines. To enjoy this exclusive discount, customers need to checkout using their Visa card and the markdown will be applied automatically. How much easier and more festive can your shopping experience get? Imagine buying a brand new iPhone 5C less 15% discount! Apart from the Visa deal, almost 5,000 items in the site are discounted up to 80% off! Brands such as Sony, Apple, Acer, Samsung, Casio, Tomato, TRESemmé, Pond’s, Wimpex, and more are up for grabs! With such incredible deals and massive discounts, shoppers can purchase all of their holiday treats in the comfort of their homes. No need to rush and brave the holiday traffic! During the two-hour Visa sale, cardholders can choose from a huge selection of more than 36,000 items, plus a whole lot more other sensational promotions—irresistible bundles and gifts, great gadgets on sale, and as much as PhP3,000 in savings through Lazada’s fireworks of vouchers! Online shoppers better be ready for this amazing shopping frenzy and these tremendous holiday bargains! With fantastic deals on consumer electronics, household items, toys and knick-knacks, fashionable pieces, and health and beauty finds, you’re sure to find the best gifts for this season. 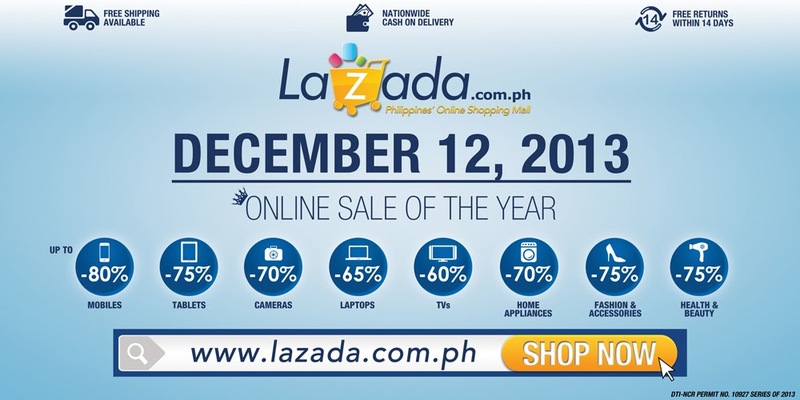 Log on to Lazada.com.ph and have a merry, jolly good ho-ho-ho-holiday! Lazada (www.lazada.com.ph) is the Philippines’ largest online shopping mall, pioneering e-commerce by providing a fast, convenient, and secure online shopping experience combined with an extensive product offering in categories ranging from mobiles & tablets and consumer electronics to household goods, toys, fashion, and sports equipment. Lazada is continuously striving to offer its customers the best possible shopping solutions with its multiple payment methods including cash on delivery, extensive warranty commitments, and free returns.